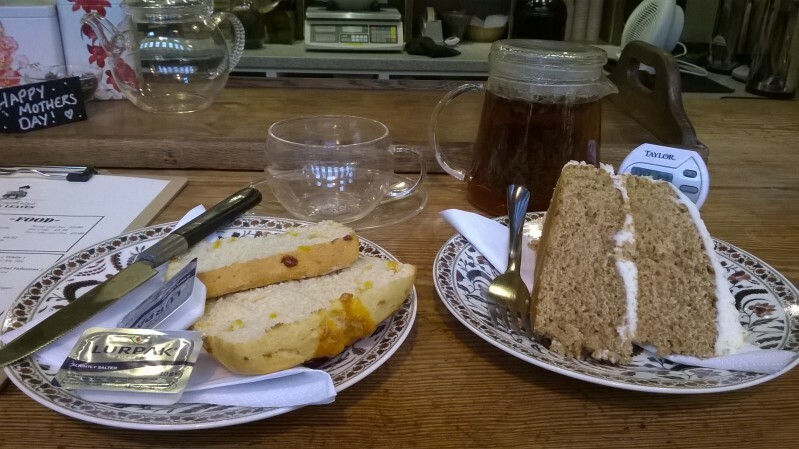 For lunch, a colleague and I went to Mrs Pumphrey’s Curious Leaves Tea Bar located on Alley One within Newcastle’s famous Grainger Market. The tea bar has been open for a couple of weeks and is a spin off from Pumphrey’s who have the Pumphrey’s Brewing Emporium located in the Arcade section of the market. Contained within a relatively small unit, there is a bar with a few stools, behind which are shelves with dozens of urns of containing many of Pumphrey’s teas – both leaf and bag. If you don’t feel up to perching on the high stools, there are couple of cosy tables and chairs. Perched on a bar stool I took a few moments to mull over the menu listing all of the different blends of tea. The assistant was kind enough to let me smell a couple of teas to aid selection. Eventually I settled on a blend I had not tried before – Nilgiri tea. To complete my usual ‘afternoon tea’ experience I added a cheese scone and carrot cake. The tea arrived brewing in a glass infuser pot, class cup and saucer which was accompanied by a timer set for 4 minutes brewing time. The tea was good malty blend typical of a black tea with a mild strength. The scone was quite good and the carrot cake was the best I have had for a long time. We enjoyed our lunch at Curious Leaves and will return.